France is located in western Europe. France is bordered by the English Channel and Bay of Biscay; Belgium, Luxembourg, and Germany to the north, Switzerland and Italy to the east and Spain to the south. Google Earth is a free program from Google that allows you to explore satellite images showing the cities and landscapes of France and all of Europe in fantastic detail. It works on your desktop computer, tablet, or mobile phone. The images in many areas are detailed enough that you can see houses, vehicles and even people on a city street. Google Earth is free and easy-to-use. France is one of nearly 200 countries illustrated on our Blue Ocean Laminated Map of the World. This map shows a combination of political and physical features. It includes country boundaries, major cities, major mountains in shaded relief, ocean depth in blue color gradient, along with many other features. This is a great map for students, schools, offices and anywhere that a nice map of the world is needed for education, display or decor. If you are interested in France and the geography of Europe our large laminated map of Europe might be just what you need. It is a large political map of Europe that also shows many of the continent's physical features in color or shaded relief. Major lakes, rivers,cities, roads, country boundaries, coastlines and surrounding islands are all shown on the map. Aix, Ajaccio, Amiens, Angers, Avignon, Basel, Bastia, Bayeux, Bayonne, Besancon, Bonifacio, Bordeaux, Bourges, Brest, Caen, Calais, Cannes, Chalons-en-Champagne, Chambery, Cherbourg, Clermont Ferrand, Dax, Dijon, Dunkerque, Grenoble, La Rochelle, Le Havre, Le Mans, Lille, Limoges, Lorient, Lourdes, Lyon, Marseille, Metz, Montpellier, Mulhouse, Nancy, Nantes, Nice, Nimes, Orleans, Paris, Pau, Perpignan, Poitiers, Port Bou, Reims, Rennes, Rouen, Saint-Nazaire, Strasbourg, Toulon, Toulouse, Tours, Troyes and Valenciennes. Auvergne-Rhone-Alpes, Bourgogne-Franche-Comte, Brittany (Bretagne), Centre-Val de Loire, Corsica (Corse), Grand Est, Hauts-de-France, Ile-de-France, Normandy (Normandie), Nouvelle-Aquitaine, Occitanie, Pays de la Loire, and Provence-Alpes-Cote d'Azur (PACA). 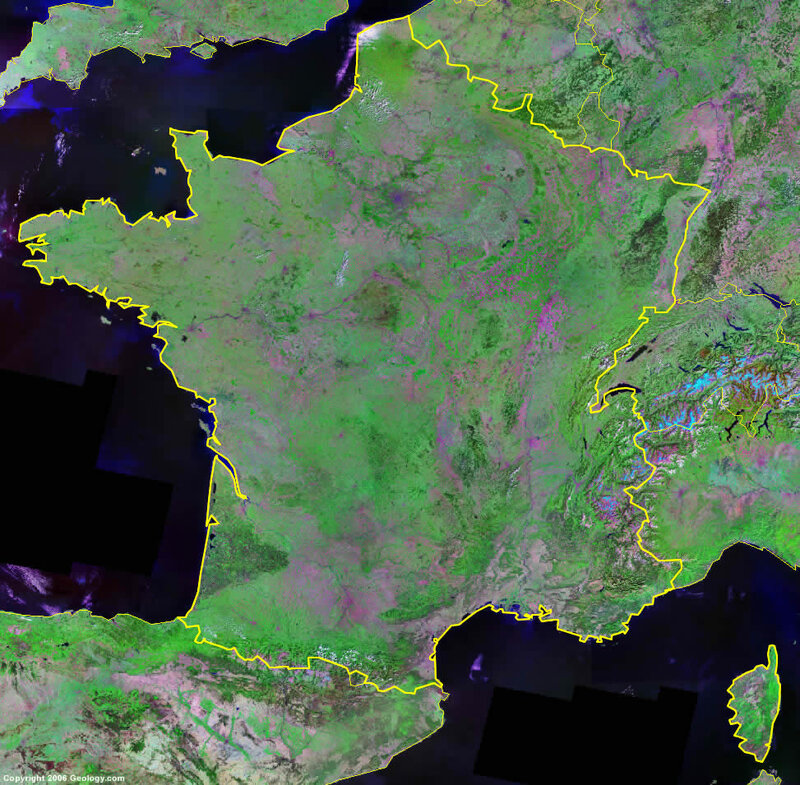 Alps, Baie de Bourgneuf, Baie de Douarnenez, Baie de la Seine, Bay of Biscay, Belle-Ile, Dordogne River, Doubs River, English Channel, Garonne River, Gironde River, Golfe de St.-Malo, Gulf of Lion (Golfe du Lion), Golfe du Morbihan, Ile de Noirmoutier, Ile de Re, Ile d'Oleron, Ile d'Yeu, Lac d'Annecy, Lac de Grand Lieu, Lac de Serre-Poncon, Lac du Bourget, Lac Leman, Loire River, Lot River, Marne River, Mediterranean Sea, Meuse River, Moselle River, Pyrenees Mountains, Rhone River, Saone River, Seine River, Strait of Dover and Ural Mountains. France has several mineral resources which include iron ore, bauxite, zinc, feldspar, fluorspar and gypsum. A variety of other resources for this country include potash, antimony, arsenic, coal, uranium, timber, and fish. France has numerous natural hazards, some of which are: flooding; avalanches; midwinter windstorms; droughts; forest fires in the southern portion near the Mediterranean. France has environmental issues concerning pollution of the air and water. The CIA's World Factbook reports that the air pollution is from industry and vehicle emissions, and that the water pollution is from urban wastes and agricultural runoff. There is some forest damage from acid rain.